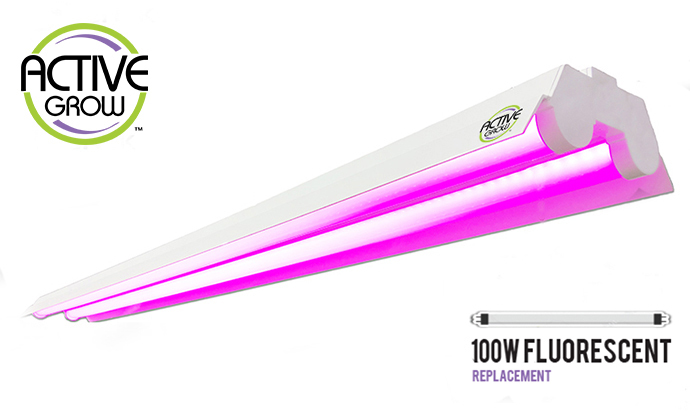 Seattle, WA, September 24th, 2018, Active Grow, the sustainable horticultural lighting manufacturer is pleased to announce the launch of the 40W 4FT LED Propagation Luminaire. The Active Grow Propagation Luminaire is an integrated two lamp fixture designed to replace higher wattage fluorescent T8/T12 (2-lamp) fixtures. The Propagation Luminaire features lower energy consumption, higher PPF efficiency, an extra-long life-time and comes in two light spectrums formulated specifically for plant growth. The Active Grow Propagation Luminaire is easy to install and can be connected end-to-end up to 5 fixtures on one 120V circuit. The luminaires’ smooth PC body works as an efficient heatsink, driving heat away from the canopy and allowing the fixture to be placed closer to plants without burning them. This not only helps save space but also makes it easier to control the growing environment. The 4FT luminaire comes with reflectors that drives light distribution evenly at 120° over the plant canopy for use in open floor plants or vertical racking systems. The Propagation Luminaire is available in two light spectrums that are 100% more effective for plant growth than fluorescent lamps. The Active Grow Sun White Spectrum features a high CRI of 95 that mimics natural sunlight, helping plants to thrive and grow to their full potential. The Sun White Spectrum also makes it easy to see any issues with plant development and is suitable for microgreens, tissue culture, leafy greens and the vegetative stages of plant growth. The Active Grow Red Bloom Dedicated Spectrum utilizes multiple dual output diodes to create a formulated 450 nm and 660 nm wavelength mixture that is ideal for propagation, root development and the flowering stages of plant growth. Both the Sun White and the Red Bloom spectrums feature wavelengths in the red (660 nm) and deep-red or IR (730 nm) range, helping to boost photosynthesis via the Emerson effect and speed up plant growth cycles by 10-20%. The Active Grow Propagation Luminaire is suitable for use in commercial plant production, home grows, vertical farms, greenhouses, hydroponics applications and more. The 4FT grow light fixture has a 40,000-hour lifetime and all components and manufacturing processes are certified safe by UL standards. 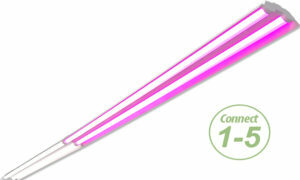 For data sheets and more information about the LED Propagation Luminaire click here. The LED Propagation Luminaire is now available for shipment from our Seattle warehouse. Contact our support team here or at info@activegrowled.com and tell us about your project so we can calculate your overall savings and help get you on the path to sustainability. Active Grow team members can also help determine what utility rebates may be available in your area that can have you saving even more right away.